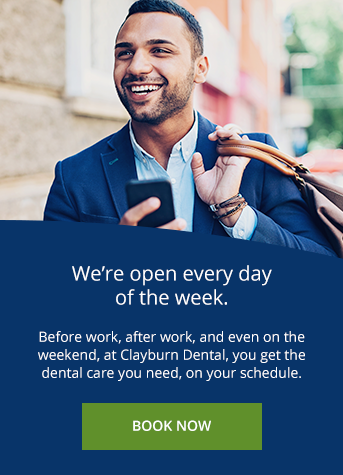 Our dentists at Clayburn Dental are always readily available to provide urgent care for Abbotsford patients with dental emergencies. Your dental health is our number one priority. In need of emergency dental care? Please call our dental office at (604) 852-8487 to schedule a same-day appointment. We understand that dental emergencies can occur at any time. We're open 7 days a week and committed to providing same-day emergency dental care to those that require immediate attention. Prompt treatment is almost always required to alleviate pain and to ensure the teeth have the best possible chance of survival. If there is severe pain, it is best to make an appointment with the dentist as quickly as possible. The pain caused by dental emergencies almost always gets worse without treatment, and dental issues can jeopardize physical health. Having a knocked out tooth is one of the most serious dental emergencies for permanent teeth. However, there’s a strong chance the tooth can be saved if it is immediate placed back in the tooth socket and dental treatment is sought straight away. If you are unable to reach our office, go to the nearest hospital emergency room for treatment. In the meantime, follow the tips below to avoid further damage to a knocked out tooth. 1. Locate the tooth and try not to touch the root (the part of the tooth under the gum). 2. If the tooth is dirty, hold it by the crown (the smooth white part) and rinse with milk. Do not use water or scrub with a washcloth, shirt or other fabric. 3. If you can, push the tooth back into its socket, facing the right way. Hold the tooth in place by gently biting down on a piece of gauze or fabric. If it doesn’t go back in place easily and without pressure, then keep it moist. 4. To keep the tooth moist, you may drop the tooth in a glass of milk or “store” the tooth in your mouth without swallowing it. It is important not to let the tooth dry out. When a tooth has been knocked out, the nerves, blood vessels and supporting tissues surrounding the tooth are damaged which is why treatment almost always requires a root canal. If your tooth is not salvageable, then alternatives may be explored such as dental implants or dental bridges. Toothache or tooth pain is common, but often the cause may not be immediately obvious. It is usually caused when the nerve of a tooth is irritated, but there are other causes, including: infection, decay, gum disease, injury, fractures, failing fillings or crowns, loss of a tooth, or TMJ disorder. It is not unusual to feel mild pain from pressure or hot/cold exposure to the tooth, but if you are experiencing moderate to severe tooth pain then that may signal a dental emergency. If you are experiencing one or more of these signs and symptoms, contact our dental office for emergency dental care. Breaking or chipping your tooth can result from a variety of incidents, such as: using your teeth to open things, biting down on something hard, falling, or receiving a blow to the face. Although our teeth are remarkably strong, its strength has limits, especially if the tooth is already weakened by some decay. If you have a broken or chipped tooth, contact us to schedule an appointment to prevent further damage or infection. In the meantime, you can take over-the-counter pain medication and avoid biting down on the broken tooth. Repair will depend on severity, but more often than not, it can be repaired in one visit. A loose tooth could result from an injury or accident, teeth grinding during sleep, or gum disease. If you have a loose tooth, please refrain from tempting to wiggle or pick at the tooth to avoid the risk of infection and excessive bleeding. Tooth mobility is never a good sign, but you don’t have to lose your teeth. At the first hint of a loose tooth, call our office immediately to schedule an emergency dental appointment. Tooth decay is the most common culprit for a filling or crown to fall out completely. Decay underneath the filling or crown can destroy part of the tooth, so it no longer has a tight hold on the filling or crown. Without a protective cover, the exposed tooth is often sensitive to temperature, pressure or air. While a lost filling or crown is rarely a dental emergency, make an appointment to see your dentist as soon as you can to have it repaired.